This is probably the shirt that has gotten me into the most interesting conversations. I got it at the original Fox Fest. This show was a three day thing at the Plaza of Nations. I got to see so many bands for the first time there. All the bands were Canadian. It was a great show. I saw some despicable ugliness from one human to another human in the mosh pit. It was during the Tea Party's night closing set, this put me off for a while, and I still don't like moshing to this day. 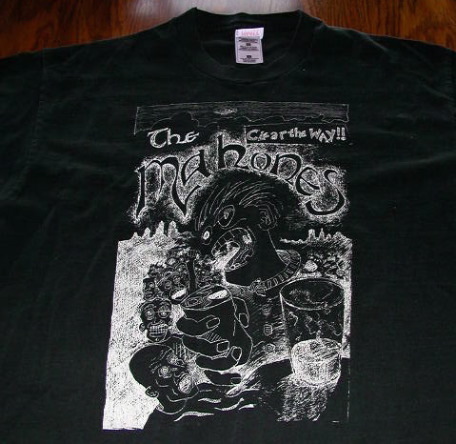 Of all the bands there, some who went on to become more famous some who did not, I decided to buy a Mahones shirt. Other bands that impressed me that night were: Big Sugar, Rymes with Orange, and The Headstones. I've since gone on to see Big Sugar so many times I've gone deaf. Well not quite, but they are certainly loud. I've since seen the Headstones again too, but I've never been lucky enough to see the Mahones again. I've been to Kingston, even to the Toucan. They played once while I live in Vancouver but I had to help my sister move and was in Victoria that day.